How we choose which foods to eat is growing more complicated by the day, and the straightforward, practical approach of What to Eat has been praised as welcome relief. As Nestle takes us through each supermarket section - produce, dairy, meat, fish - she explains the issues, cutting through foodie jargon and complicated nutrition labels and debunking the misleading health claims made by big food companies. With Nestle as our guide, we are shown how to make wise food choices - and are inspired to eat sensibly and nutritiously. "Eat food. Not too much. Mostly plants." These are the first words of Michael Pollan's In Defense of Food: An Eater's Manifesto. Scott Brick narrates these opening sentences with slowly paced emphasis and a nicely modulated deftness, with a hint of coyness. The coyness is Pollan's. For what else can one eat but food? And why does eating need a manifesto? Pollan answers that we increasing do not eat food (whole food) but rather consume processed "food products". We are in "The Age of Nutritionism". Pollan's In Defense of Food is a richly developed polemic against the unhealthful food culture that the ideology of nurtitionism represents. The book is as well a de facto manual for growing and eating our way out of it. Brick is a compelling spokesman for Pollan's argument. He brings to In Defense of Food a voice in the baritone-to-tenor range, with an always on-the-mark sonic focus matched with a point of expressive emphasis that constantly shifts, as Brick makes his flawless and fluent runs up and down and within his octave ranges. Brick's doing all of this can only be achieved by natural talent, disciplined training, and smart reading  joined by a mastery of a quite large array of narrative and expressive skills. "Eat food. Not too much. Mostly plants." 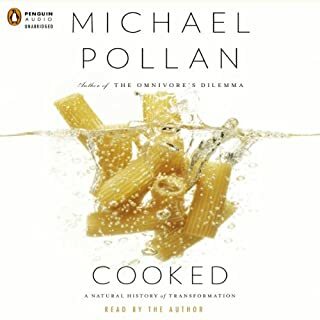 These simple words go to the heart of Michael Pollan's In Defense of Food, the well-considered answers he provides to the questions posed in the bestselling The Omnivore's Dilemma. Humans used to know how to eat well, Pollan argues. But the balanced dietary lessons that were once passed down through generations have been confused, complicated, and distorted by food industry marketers, nutritional scientists, and journalists-all of whom have much to gain from our dietary confusion. As a result, we face today a complex culinary landscape dense with bad advice and foods that are not "real." These "edible food-like substances" are often packaged with labels bearing health claims that are typically false or misleading. Indeed, real food is fast disappearing from the marketplace, to be replaced by "nutrients," and plain old eating by an obsession with nutrition that is, paradoxically, ruining our health, not to mention our meals. 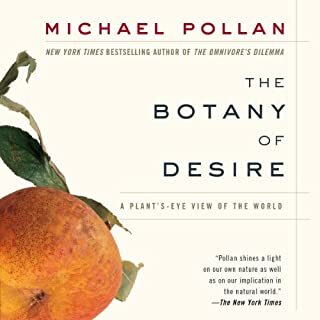 Michael Pollan's sensible and decidedly counterintuitive advice is: "Don't eat anything that your great-great grandmother would not recognize as food." In looking toward traditional diets the world over, as well as the foods our families-and regions-historically enjoyed, we can recover a more balanced, reasonable, and pleasurable approach to food. 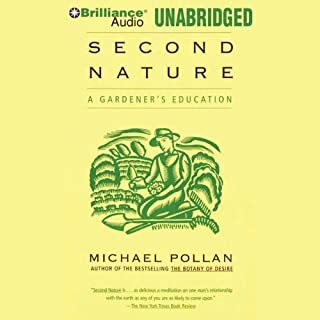 Michael Pollan's bracing and eloquent manifesto shows us how we might start making thoughtful food choices that will enrich our lives and enlarge our sense of what it means to be healthy. 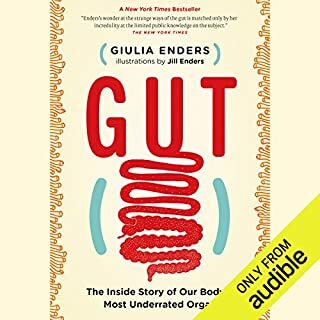 After years of surging insulin resistance and the accompanying host of metabolic disorder symptoms (high cholesterol, high triglycerides, high blood sugar) I now follow the simple rules in this book. I still eat meat but a tiny fraction of what I ate for my first 50 years. I eat mostly plants, not too much. I avoid packaged, processed food. I've lost 100 pounds, LDL went from 285 to 83 and my insulin resistance has vanished. This book has saved my life, seriously. DRAMATISE IT FROM THE ROOF TOPS! This is the most down to earth (pardon the pun;-) and sensible diet book I have ever listened to. At the end, I thought "I can do this" and still enjoy my food. Scot Brick's dramatisation and pausing at just the moments when I needed to consider an important point, really made the listening easy and enjoyable. Bravo! Bravo! This is a very informative, easy-to-listen-to book. 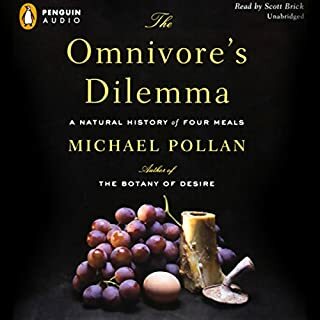 An Omnivore's Dilemna is an excellent account of the writer's exploration of how food gets from the farm to the plate, and this book answers the question he most often received after publishing the first, "What should we eat?" Very pratical, realistic and soundly written, he discusses the nature of the food industry and food itself. Enjoyable and worthwhile. If your looking for a Diet book read this first! I enjoyed the book, but if you haven't read The Omnivore's Dilemma, read it first - not as a prequel, but just because it's a more in depth discussion of our industrialized food system and how it's failing us. You may not be convinced of this by In Defense of Food, but you will be by The Omnivore's Dilemma. 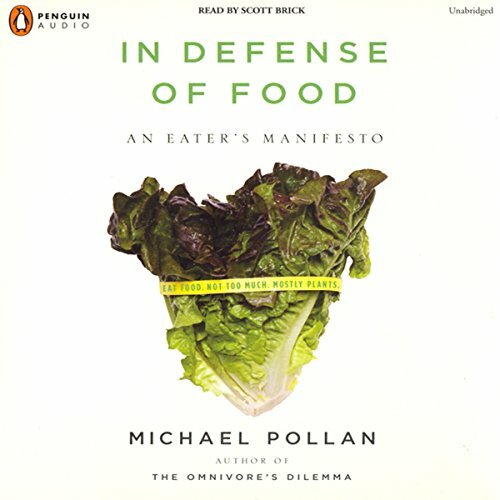 If you have The Omnivore's Dilemma, this book is a bit like preaching to the choir, but still well worth the read. Also, I hate to "dis" the narrator, but he distracts from the book. I've heard his narration of other books and enjoyed them, but they were all fiction. He put a little too much drama into his reading of this non-fiction book about food. The best books affect you, make you think and sometimes they even make you change your day to day habits. This is one of those books, a short read of ground shifting potential. And like all great books I’ve read, it starts with a simple premise and a simple question: Western culture is, by and large, health obsessed and has been for a while. We count calories, we examine fat content, we examine with finite prevision the nutritional makeup of our foods. So why, in a culture of nutritional obsession are we getting sicker and sicker every year? What the author poses as an answer is, to use his words, that we have removed culture from our eating habits (culture being a word that means your mother). So he examines the food industry for all its faults and suggests an alternative: eat food, not too much, mostly plants. It’s strange that someone would need to spend a whole book defending food but most of what we eat is not, strictly speaking, food. You should read this book, it has made an impact in my life. So go on, get cooking. I really enjoyed listening the this book, partly because Scott Brick is one of my favorite narrators. This book has given me a new perspective on what I should consider to be food and what I should be eating. So much of what we eat is processed "food" and the author tries to connect the change in the Western diet with the increased levels of obesity and other health problems we see in society. The author has certainly convinced me to check labels more closely and to eat more fresh, non-processed food. 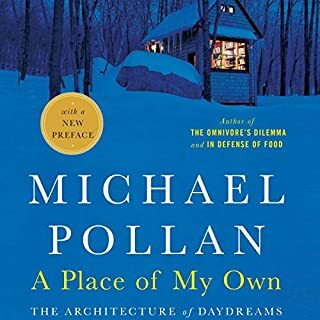 I really don't want to give this or any book a bad review because I'm usually not in the habit of criticizing others, but Michael Pollan's book which, I would enjoy if I read, was not so pleasant to listen to because of the overly exaggerated tone of the narrator. I'm sure Scott Brick is wonderful with fiction, but non-fiction with a continues sarcastic tone is really too much. For what it's worth, I recommend buying the book. This book, "In Defense of Food," is galvanizing, offering a holistic re-orientation to the whole realm of food and all that's involved in it. Pollan gives us a useful new villain, "nutritionalism" (a term previously coined by another author), which is our (and more so, "the pro's" - researchers, dieticians, etc)tendency to want to think of foods in terms of individual nutrients - carbs, protein, fat, micronutrients (vitamins, minerals, co-factors, enzymes, etc), and the omnipresent calorie. This is inculcated through our whole culture, and Pollan suggests it is a BARRIER. He suggests that ESCAPING that fragmented, malfunctioning mindset is our salvation, and offers holistic means of achieving the health and dietary peace that evades us. Otherwise, excellent: brilliantly conceived, creatively researched, beautifully written. And the reading is simply top-notch, the pairing of book & reader is a marriage made in heaven. Scott Brick's delivery is as articulate, as accurate, as brisk, and as bitingly accusatory as David Hyde Pierce, while being as soothing, helpful, hopeful and compassionate as the movement of the text demands. It is a big topic Pollan has taken on, in terms of the technical scope of the material as well as the social reach of his analysis, and I think he's done a marvelous job, really hit the nail on the head, or very nearly so. I have his other book, "Omnivore's Dilemma" in my library and can't wait to get to it next.